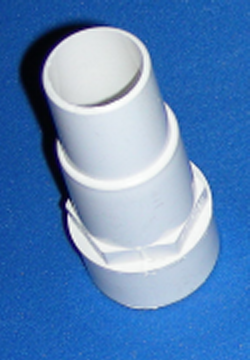 Swimming Pool Vacuum Hose Adapter - Tapered Fitting fits into most swimming pool hoses by 1.5 spigot (glues into 1.5" sch 40 socket/fitting.) White. For use with Swimming Pool Vacuum Hose. May also be used as a metric or other adapter. Tapered side has 2 sections. First goes from 31.90mm to 33.82mm (1.25" to 1.33") OD and the second goes from 38.83mm to 40.48mm (1.52" to 1.59") OD.